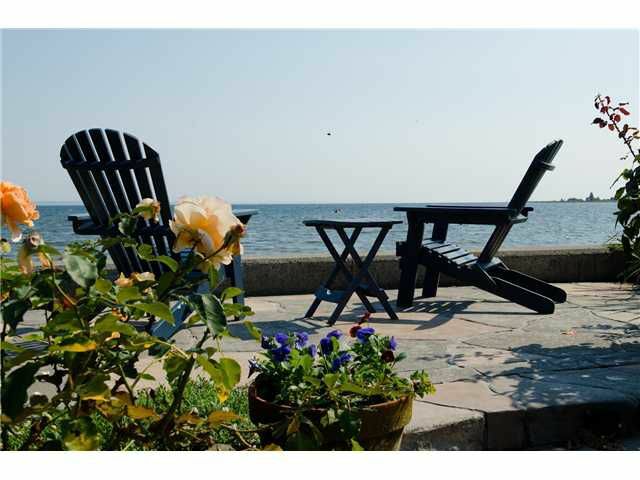 Live "The Beach Grove" lifestyle in this exceptional WATERFRONT property. Unwind from the hectic pace of the city & enjoy the ever changing water seascape on the sun-filled patios surrounded by beautiful mature rose gardens & intimate outdoor spaces. This elegant residence has been designed with entertaining in mind with the kitchen, living & dining rooms all with sweeping water views & outdoor accesses. The original home was completely renovated in 2003 including a stunning new addition giving more living space with a library gallery, family room & a bonus hobby room with an ocean glimpse balcony. The master has spectacular views of the waterfront & MT Baker. Come home to tranquility & you will never want to leave.